Home » Uncategorized » Today (Oct. 13, 2017) is World Thrombosis Day…. check it out! Today (Oct. 13, 2017) is World Thrombosis Day…. check it out! Join thousands of partners, survivors, supporters, and many others around the world today to recognize and celebrate World Thrombosis Day (WTD) 2017. More than 1,000 campaign partners in more than 85 countries have organized thousands of events and activities that are taking place today. In addition, our global community is spreading the word through social media and other digital activities to educate and inspire others. ClotCare.org, a participating partner, appreciates the enthusiasm, time, support, and creativity as we stand together in a united effort to raise awareness about potentially deadly blood clots. With 1 in 4 people worldwide dying of conditions related to thrombosis, there is no better time than right now to take action. 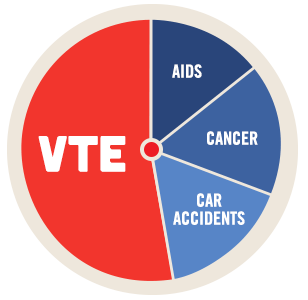 In the U.S. blood clots in the venous system [venous thrombembolism or “VTE”] kill more people that HIV/AIDS, breast cancer, and auto accidents COMBINED!! And that does not include the clots that cause heart attacks and strokes. By Henry I. Bussey, Pharm.D. in Uncategorized on October 13, 2017 .